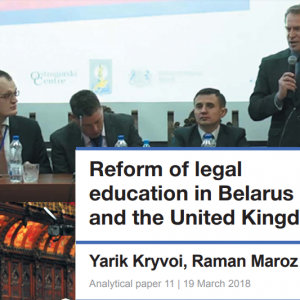 The Ostrogorski Centre presents a new analytical paper ‘Reform of legal education in Belarus and the United Kingdom’, written by Yarik Kryvoi and Raman Maroz. 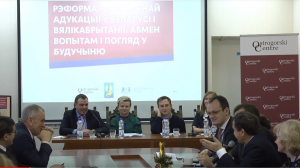 The paper primarily based on suggestions made during a conference on legal education reform held on 28 December 2017 in Minsk. The Ostrogorski Centre and the Faculty of Law of the Belarusian State University it with the support of the British Embassy. Dedicated to the issues of legal education and its reforms in Belarus and the United Kingdom, the conference allowed academics, practitioners and administrators to discuss best practices and trends in the field of legal education. The main topics concerned the organization of the education process and improvement of professional skills of students, as well as opportunities for international cooperation in legal education. The analytical paper suggests that the government plays a more significant role in the regulation of the economy in Belarus compared to most other European countries. That is why further development of the legal system in Belarus and training of legal professionals should be at the top of the agenda. The rule of law is an essential foundation for the market economy that provides an environment for the creation and preservation of wealth, economic security and welfare, as well as a better quality of life. Strengthening the rule of law is a challenge for all post-Soviet states and Belarus is no exception. The Concept for the Development of Legal Education in the Republic of Belarus through to 2025, adopted by the Ministry of Education in 2017, partly addresses the problems faced by the contemporary Belarusian legal community. These problems include a lack of practice-oriented courses for students and the need to improve the professional training of teachers. The main problems facing the modern Belarusian legal education appear to include the excessive teaching load of academics, the lack of practical skills development, bureaucratic mechanisms for attracting foreign funding, insufficient funding for training teachers abroad, weak foreign language skills, and the lack of new education and academic technologies, including access to online databases and virtual learning environments. Belarus ranks 52nd in the Human Development Index of 188 countries in the UN Development Program, which is one of the highest positions among the countries of eastern Europe. This indicates that Belarus is competitive in the field of education generally. In order to put in place legal education reforms, a wide range of professionals should be involved, as well as more active cooperation with non-governmental educational institutions and universities abroad. This will allow the sharing of best practices in the area of legal education. The adoption of the Concept for the Development of Legal Education through to 2025 and discussion of the Concept with the academic community marks an important step forward. In addition, to improve the quality of legal education in Belarus, we should also consider international best practices, including the United Kingdom’s experience. Th paper makes the following recommendations. Law schools could reduce the number of compulsory teaching hours to increase the time for research activities. Belarusian students need to learn to work independently with study materials to develop analytical and critical thinking skills. Courses that are not related to law should be excluded from the curriculum. This would enable Belarusian students to save one year of study and enter the labour market earlier. More emphasis should be put on written work as a means of assessing the knowledge level of the students. Educational institutions need to create satisfactory conditions for the exchange of best practices between academics from Belarusian law departments and their foreign counterparts if they are to attract international scholars to work in Belarus. Furthermore, it is important to search for funding for additional legal training of teachers abroad and work on simplifying the rules for receiving grants from foreign and international organizations. It is necessary to organize foreign language courses and support publications from Belarusian academics in internationally recognized journals. Belarusian legal education should expand their libraries and, as a first step, increase access to international online databases. Some internationally-known databases may be persuaded to provide access at a reduced price or for free. Improved university reputations cannot function properly without the participation of students in international legal competitions and conferences, so Belarusian institutions should encourage students to take part in them. The problem with the employment of students can be partially resolved through the creation of university careers centres, the role of which would be to establish contacts with potential employers and prepare students for successful employment. As the Concept for the Development of Legal education in the Republic of Belarus through to 2025 shows, the legal education system struggles to produce graduates with all the necessary skills and knowledge for the marketplace. It is, therefore, necessary to focus on the development of students’ scientific activity through the introduction of courses on academic writing and advising students and academics on publishing in international scholarly journals.